Everything you need to know about the 2018 Biennial Conference ... All on one page! Look at all the HOTEL options! What is YOUR Role in Volunteer Leadership? Have you ever wondered how RID does all that it does at the national, regional and local level? Volunteer leaders are the key. In this workshop you will find out about the backbone of our professional organization and how you can become a volunteer leader serving your community and professional peers. Do you ever wish you had a more concrete way of making ethical decisions? Well, this workshop will equip participants with just that. We will begin by laying the groundwork for ethical decision making by identifying distinguishing characteristics of a person who is ethical and how that relates to our individual and group values. Then we will apply a step by step approach to analyzing ethical dilemmas and discuss how to use the same seven-step process to talk to peers and colleagues through the ethical decision making process. Participants will discuss why it is important to have a mentor, what are the qualities of a mentor, when should you get a mentor, and what kind of mentor. The participants will look at both roles in a mentoring relationship as well as why this investment is so important to our profession. This workshop focuses on the preparation and process of interpreting in a more formal setting for Deaf presenters and interpreting for longer presentations (as opposed to interpreting comments or questions). This training focuses on important facts related to Deaf culture, history and language presented in an interactive Trivia Night format. We retain what we learn pleasantly so the goal is to provide a fun yet competitive atmosphere. Diversity in team selection will be encouraged and the key to excelling at this event. This unit enables learners to begin understanding the complex dynamics of working as a team with a hearing interpreter. Through observation, discussion, and direct experience, learners explore collaborative processes in achieving accurate and meaningful interpretation. This unit enables learners to observe and practice the art of building collaboration for the DI/HI team efforts through pre- and post-conference meetings. Learners use collaborative strategies to prepare for interpreting assignments. During interpreted interaction, learners strategize for verification of meaning, clarification, mutual monitoring, and flow management. Learners also employ effective approaches to post-conference debriefing. These workshops will be presented in ASL. Strategies for Interpreting for DeafBlind consumers. Interpreters will learn about the body's anatomy broken down into systems & organs: what each system/organ function is, what specialists you would see at a doctors office, the medical procedures in conjunction with the body's organs. Interpreters will also be given interpreting samples throughout the workshop as well as hands on material to apply the knowledge they have just learned to have a "patient and doctor" interaction. Melvin Walker received his B.S. in Psychology from Athens State University and M.Ed. in Rehabilitation Counseling from Auburn University. He has been employed by the Alabama Institute for Deaf and Blind for the past 2 years as the Director of Services for the Deaf, DeafBlind, and Employment. He is also the Director of the Alabama Initiative for Children and Youth who are DeafBlind. Prior to this he was employed by the Alabama Department of Rehabilitation Services for 13 years as a Senior Rehabilitation Counselor. He is also employed by Sorenson Communications as a part-time VRS Interpreter. Melvin has been involved in the Deaf world all of his life and has been connected professionally for the past 28 years. He has served numerous years on the Boards of the Alabama Chapter of RID, the Alabama Association of the Deaf and the Alabama Licensure Board for Interpreters and Transliterators. Melvin has served on the Board for the Registry of Interpreters for the Deaf since 2013 and is the current President of the organization. Theresa Richards has been interpreting for twenty-five plus years and holds an NIC Master certification from RID. Over the course of her career, she has interpreted in educational, community and corporate settings as well as in VRS. As an interpreter trainer, Theresa has developed and presented numerous workshops and taught at the ITP and community level. Currently she is a Program Manager in the Professional Development Department for Sorenson VRS, where she screens and trains Video Interpreters both through workshop presentations and online trainings. It is Theresa's desire to be a resource to other interpreters and to help each person be their own personal best. Although work keeps her very busy, Theresa makes time to serve at her church, spend time with friends and family, and enjoys every minute she gets with her husband, Cliff, and their amazing son, Zane. After college graduation, Chris made the decision not to wait for Medical School and began a career as a college football coach. While coaching, Chris was introduced to the Deaf community and American Sign Language. His Deaf mentor encouraged Chris to move to the Washington, DC area to be near Gallaudet University to become immersed in the Deaf World. Thus began the journey of language acquisition and cultural awareness, which would lead Chris into various settings within the Deaf community: teacher, counselor, chaplain, and interpreter. Chris currently works in Video Relay and Education settings. I have a BA in Radio, TV and Film from UGA and a master’s degree from Gallaudet in ASL Linguistics. After graduating from Gallaudet, I was hired by their TV production studio to write, edit and produce segments for Deaf Mosaic as well as countless training videos. I’ve been a certified interpreter for over 35 years, a workshop presenter for 25 years, and an interpreter educator both full and part time for 23 years and a part-time Sorenson VI for nine years. I now work for Sorenson Community Interpreting Services full-time as the director of Georgia SCIS and as the SCIS Director of Profession Developments and Standards. .
Outside of interpreting, I create art-- from bookbinding to beading to dog portraits. I have my own pack of dogs (all rescue) and a cat (also a rescue). I believe that what interpreters do is valuable beyond measure, important, complicated, amazing, and often surprising. I want all interpreters to truly appreciate their crucial roles in people’s lives and know their worth. Stacie is the Staff Interpreter with the Alabama Department of Rehabilitation Services at the Huntsville office. She also works occasional weekends at Sorenson Communications and is a contract employee of Alabama Institute for the Deaf and Blind. She has interpreted, taught ASL classes and skill building workshops since 1987. Some of her favorite interpreting includes medical and theatrical work. She is certified with the Registry of Interpreters for the Deaf (RID) and holds a license in the state of Alabama. Stacie has served RID on local and state Boards in various positions and is currently the chairperson of the Alabama RID Professional Development Committee coordinating training across the state. Stacie is the mother of 5 children (and a multitude of their friends). Her hobbies include serving her community, scrapbooking, and volunteering in the classroom. Christopher Tester, MsC, CDI, SC:L, is Deaf and an actor, consultant, educator, and an interpreter. A seasoned presenter, he specializes in workshop and seminar facilitation on topics (not limited to) disability rights and laws, Deaf and hard of hearing awareness, and interpreting. He is currently an adjunct faculty member of the CUNY's ASL/English Interpreter Education Program. He has interpreted for several off and on Broadway shows, National and International conferences, at the United Nations and specializes in legal interpreting. Chris received his Masters in Science and Communication at Heriot Watt University and received his Bachelor's degree at the College of the Holy Cross. Additionally he received his Professional Certificate from the CUNY's ASL/English Interpreter Education Program. He is currently a PhD student at Heriot Watt University and is living in Edinburgh, Scotland. Ms. Darling is currently employed as the State Coordinator of Interpreter Services for the Alabama Department of Rehabilitation Services. In this capacity she is responsible for coordinating interpreting services for statewide trainings and conferences. She also supports the needs of the 10 ADRS staff interpreters located across the state. Ms. Darling has been a certified interpreter for more than 15 years. She has a Bachelor’s degree in Criminal Justice from Faulkner University and a Master’s degree in Public Administration from Auburn University at Montgomery. She has worked in various venues prior to joining the Department of Rehabilitation Services, including the Alabama Department of Mental Health, Sorenson, Janice Capilouto Center for the Deaf and the Alabama Institute for Deaf and Blind. Her passion is interpreting for the DeafBlind population. She has interpreted several conferences including the American Association of the DeafBlind 2011 Symposium, DeafBlind Retreats, and the 2018 DeafBlind International’s Network of the America’s conference. Ms. Darling has presented on the topic of interpreting for the DeafBlind many times around Alabama and in Peru. Ryan is a first year medical resident specializing in physical medicine and rehabilitation at the University of Alabama-Birmingham. He received his medical degree from Indiana University in 2017. As a graduate assistant, Ryan was an associate anatomy lab instructor for Trine and Huntington University's physical and occupational therapy programs. He was also a graduate assistant for the University of St. Augustine's spinal anatomy and examination course. His medical research experience centers on sacral neuroanatomy and regenerative stem cell therapy for rotator cuff injuries. Prior to attending medical school, Ryan received his doctorate in physical therapy from the University of Saint Augustine. He was a practicing physical therapist for five years and a volunteer clinical professor for Indiana University's school of physical therapy. Angelica attended an Interpreting Training program at Goshen College in Indiana where she received her bachelors in Interpreting. During her training she attended Gallaudet for one semester and attend courses in Deaf Culture, the history of oppression, ASL linguistics and Interpreting. Her program required an internship which she completed within the Clearwater/St. Petersburg, Florida area working under a small agency operated by two Deaf women and one hearing interpreter. After college she worked as an Interpreter Coordinator and a staff interpreter at a non-profit in Indiana for 4 years and was involved in setting up events throughout her community. She also served on the ICRID board. For the last three years she has been a freelance interpreter and a VI at Sorenson. 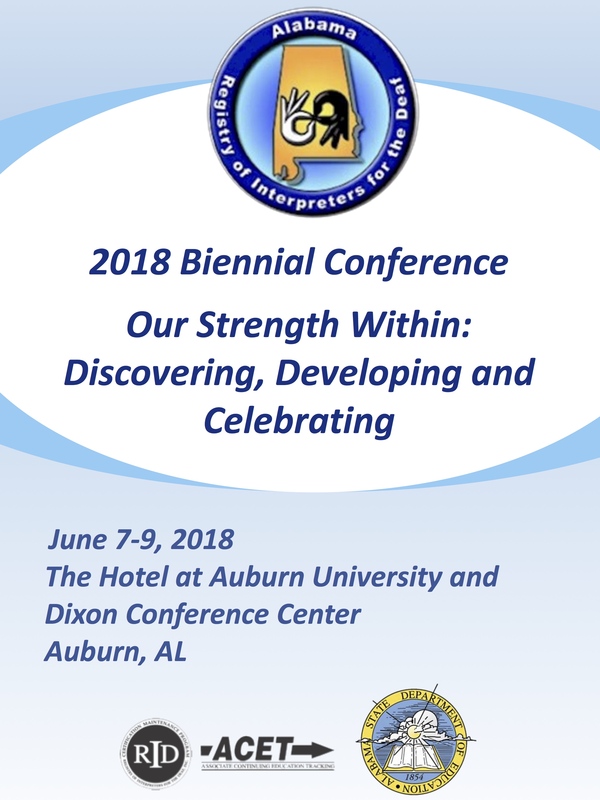 The Hotel at Auburn University and Dixon Conference Center is the host hotel for the 2018 Biennial Conference. It's a busy time in Auburn! If the host Hotel doesn't have any rooms available under our block, check out the Auburn/Opelika Tourism Bureau for more hotels in the area.